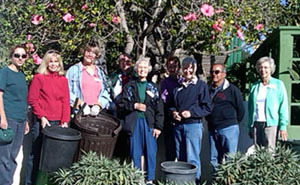 Rancho Los Alamitos Garden Volunteers help maintain and enhance the beauty of the Rancho gardens. 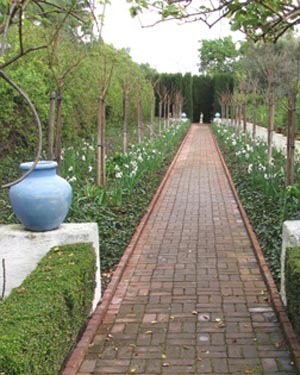 The Rancho’s four acres of gardens are historically and culturally important. The existing gardens evolved from 1906 through the late 1940’s, and while such notable designers as the Olmsted Brothers Firm, Florence Yoch and Paul Howard were involved, the guiding influence is clearly that of Florence Bixby. Developed in an era of flamboyant regional horticulture, her ranch gardens stand apart for their restrained elegance. If you enjoy gardening, expert or amateur, and are available on Tuesdays from 9:00 am until 12:00 pm,join our volunteers and skilled horticultural staff in their ongoing efforts to restore and preserve this unique landscape. The best part of being a Rancho Los Alamitos Garden Volunteer is being able to enjoy the peace and tranquility of the gardens and to know that what we do not only preserves history, but also contributes to our visitors’ experience of these lovely gardens. For more information, please call us today at (562) 431-3541 or complete our online Volunteer Application.